In this important article, Rudhyar foresees the deep confrontations, revolts and transformations to occur from Berkeley to Washington, DC which would radically change the world and ourselves during the Uranus-Pluto conjunctions of 1965-66. "The conjunction of Uranus and Neptune in 1821 and of Uranus and Pluto in 1850-51 paved the way," Rudhyar writes, "as it were, for what has been slowly unfolding until now. These two cycles were preludes; they marked critical states, the periods of transition between the old and the new. Now the real thing is about to happen, and obviously many people will not like it. The institutionalized minds of political leaders, university regents and boards of trustees or directors will fight against the change, just as classes and groups owning privileges and special positions have always fought against inevitable social, political and cultural changes. But the new always wins in the end, tragic as may be the victory." » Timelines 1965-66, an online resource. On October 9th, 1965 at 3:17 P.M. Eastern Standard Time Uranus and Pluto will be conjunct on the 18th degree of Virgo. This should hardly be news to any person interested in astrology as the magazines have spoken for a long time of this aspect made more disquieting by an opposition to Saturn. When Mars moved back and forth through this sign, Virgo, many things started in national and international politics which could well have reached some sort of climax in the days following the writing of this article, just before the May 30th solar eclipse. It may well be that the exact conjunction of Uranus and Pluto will not bring to a still sharper focus the critical issues affecting humanity; but we should not lose sight of the fact that two more exact conjunctions will happen next year, on April 4th and June 30th, and both on the 17th degree of Virgo. In February, 1966, following a New Moon at 1 1/2 deg Pisces, Mars will meet Saturn on the 18th degree of Pisces (together with Mercury and, on February 21st, with the Moon), in practically exact opposition to Pluto and Uranus; then also Jupiter will be squaring this opposition from the 22nd degree of Gemini. On March 14th the Moon passing through Sagittarius will complete the four-armed cross in mutable signs. 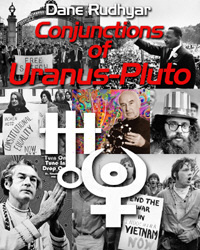 The June 30th conjunction of Uranus and Pluto is theoretically freed from the pressure of Saturn's opposition, and in sextile to the Sun and Jupiter — but November 1966 brings once more oppositions of Saturn to Uranus and Pluto with Mars once more conjunct Pluto and Uranus (November 16th-22nd) and opposing Saturn (November 21st). We therefore are confronted with an extensive and prolonged situation, and it would be rather foolish to expect that this first Uranus-Pluto conjunction on October 9th, 1965 will end a process. It is more likely to begin one. The beginning of this process of transformation may be rugged, and it will no doubt last through 1966. In a sense, as we shall see presently, it will affect an entire cycle, though the trine of Jupiter to Saturn on July 25th 1967 might be expected to bring a relaxing of the immediate tensions. Another significant clue to the whole situation is that it is this autumn of 1965 that the heliocentric planetary cross-configuration in mutable signs reaches its climax. Around November 1st, 1965, Saturn opposes Uranus and Pluto in practically exact conjunction. The Sun thus finds itself pulled by the planets in opposition. Moreover Jupiter has been opposed (heliocentrically), by Mars and Venus in Sagittarius early this September, squaring the Virgo-Pisces axis; also the heliocentric square of Jupiter to Saturn occurred around July 1st, 1965. Thus a progressive build-up of cosmic tension during the summer could well reach a climax this fall — a climax prolonged through the winter 1966. After having stated these astronomical facts, the problem is how to interpret them astrologically; that is, how to translate the cosmic picture into words and concepts having validity for a human being operating today in the biosphere of this planet, earth. In Greek mythology, Ouranos was originally the great deity whose realm was the immensity of space, and whose wife, Gea, was the earth. He represented the immense fecundating power of the universe, but his many children were thrown by him into the infernal abysses, that is, they sank into pure unconsciousness. The union of Ouranos and Gea represented the compulsive power of life which created incessantly and limitlessly, but in unconsciousness. Gea, however, saved one of her children, Saturn-Chronos, who eventually castrated and dismembered his father. The boundless creative power was broken in fragments, and the god of limited time and cycles, Saturn, ruled as the ego of an earth-field within which, because it is limited and definable, consciousness could then emerge. Thereafter a new generation of gods arose. Zeus-Jupiter is the god of the clear sky, the symbol of lucid consciousness. Neptune rules the sea, matrix of living organisms. Pluto controls the earth-foundation of all existence, the soil into which all lives return after autumnal disintegration. Pluto rules also over the underworld in which human beings after death are reabsorbed in the vast psychic humus, the womb from which humanity is ever reborn (i.e. Jung's collective unconscious), in its periodic ascent toward conscious, rational and individualized existence. When Uranus is conjunct Pluto a new cycle in the relationship between the human factors which these two planets symbolize begins. The cycle now ending began in 1850-51 at the time when the spread of the Industrial Revolution began to affect directly and indirectly, through colonialism, the whole of humanity. Pluto was not discovered yet, so that the factors in man which it represents had not yet emerged into man's collective consciousness. These factors, in our modem world transformed by the very technology which enabled us to discover the planet Pluto, refer to the progressive "planetarization" of mankind — to whatever seeks to unite men in terms of the most basic common denominator, in terms of their most elementary common humanity. Unless a nuclear total war almost completely disrupts human evolution, there seems to be no doubt that a global or planetary society encompassing all human beings will take shape next century, perhaps after a period of reorganization beginning around 1989-90. Such a society is already a fact at the level of world-communication, industry and indeed of international politics. However, the Jupiterian and Saturnian traditions of our still surviving separate and proudly individualistic cultures and nations are stubbornly resisting the changes which Uranus has brought to us since it was discovered late in the 18th century. Uranus by itself can only start the process of transformation. This process needs also the operation of other factors represented by Neptune and Pluto. Thus the cycles of relationship linking these three planets are most important. Every conjunction begins a new cycle. There was a conjunction of Uranus and Neptune at Capricorn 2°59' on March 22nd, 1821 (near the time of the death of Napoleon); the next one will occur on the 19th and 20th degrees of Capricorn in 1993. In 1821 Neptune had not yet been discovered, just as in 1850 Pluto was still unknown when Uranus came in conjunction to it in the last degrees of Aries. Thus one might say that a fully conscious awareness of the great process of all-human planetary change which began in the 18th century will not take place until 1993 when Uranus begins its new cycle with Neptune. What is happening today, as Uranus starts its new cycle of relationship with Pluto, is that the very foundations of man's collective mentality are being transformed; for Pluto represents indeed the planetary aspect of mind, the one mind of Man. Many psychological or para-psychological mysteries would be explained if one really understood that there is but one mind — that humanity is, at the mental level, one vast organized system. This concept is not new. It was formulated in old India under the more or less mythological symbolism of the Manus, who are not to be considered as personages but rather as different aspects of the collective mind of Man. The French archaeologist and philosopher Teilhard de Chardin, whose long suppressed writings are today being read all over the globe, spoke of the "noosphere" in much the same sense as I am speaking of the one mind of humanity. The nervous system of every individual person is like a radio tuned up differently to this one mind. Some individuals have a very poor radio able to release only one limited type of thought. Others possess an exceedingly sensitive radio-apparatus able to tune in to many frequencies. Still others are sensitive, but the radio waves of different frequencies tend to get mixed up, and mental confusion is the result. The brain-radios can transmit as well as receive so that the noosphere (mind), is as complex a realm as the biosphere (life), the realm where all living organisms on earth act and interact under the compulsive urges of life. This realm of life is essentially operating, through the element, water. Life began in the sea. When understood in its collective rhythms, it has much to do with Neptune. Most of the human body is actually sea water, and excellent results have been obtained in Europe by injecting purified sea water into a man's veins. A whole system of healing, thalassotherapy, is being developed, including hot sea water baths with massage, and so on. It is also being discovered, mainly by a great Italian scientist, Piccardi, that it is by the intermediary of water that still unknown cosmic energies act upon all living organisms and some colloidal substances — a discovery which indirectly supports my often repeated assertions that astrology is a Neptunian, and not a Uranian way of thinking. As I see it, the conjunction of Uranus and Neptune in 1993, ending a strong planetary emphasis in the sign Capricorn in 1989-1990, should see the start of a deep transformation of life on earth. The present conjunction of Uranus and Pluto is witnessing the definite beginning of a radical transformation of the one mind of humanity, which is also the mind of this planet, Earth, in which we move, live and have our being. The conjunction of Uranus and Neptune in 1821 and of Uranus and Pluto in 1850-51 paved the way, as it were, for what has been slowly unfolding until now. These two cycles were preludes; they marked critical states, the periods of transition between the old and the new. Now the real thing is about to happen, and obviously many people will not like it. The institutionalized minds of political leaders, university regents and boards of trustees or directors will fight against the change, just as classes and groups owning privileges and special positions have always fought against inevitable social, political and cultural changes. But the new always wins in the end, tragic as may be the victory. It is therefore futile to think of catastrophes ahead because of the rather crucial planetary aspects of these years 1965 and 1966: The only real catastrophe would be if nothing at all happened — for this would imply that man's capacity for growth has become ankylosed! But, even if this were the case, I believe that the planet itself would rise and shake man loose in some very radical manner, just as a human body can react violently and shake loose its mind, when the latter has become rigid and unyielding. We speak today of psychosomatic illnesses; but there are also illness which are somatopsychic, in the sense that they constitute a revolt of the body against a perverted or catatonic mind. Pluto, I repeat, refers to the collective mind of humanity. In a narrower sense it refers to some closely interrelated and authoritarian human groups — to modem gangs and totalitarian regimes, for in these tight human groupings only one kind of mentality is allowed. If left alone Pluto tends to level down to the most basic common denominator. It is the symbol of depth, and in a sense of the core of things, for at the earth's core everything that is subject to gravitation becomes compressed into unity. But when Uranus acts upon Pluto (and of course there is always such an action, but more or less focused and operative), Uranus does not allow Pluto, as it were, to pull everything to the bottom or core. Uranus periodically fecundates and always stirs up the realm of Pluto; and we are witnessing such a fecundation. Unfortunately perhaps it occurs in opposition to Saturn's place in Pisces, so that we are witnessing a strangely disturbing tug-o-war opposing a revolution in the depth of Man's mind to the solidified remains of the past. The square of Jupiter to Saturn in a sense helps forces of progress by focusing internecine conflicts within the realm of obdurate conservatism and tradition. The disturbance is planetary-cosmic as well as social-cultural in meaning. What actual events will release the pressures being built up no one really can tell, so complex the situation is; but the heliocentric picture of the solar system for this fall and early 1966 seems to show that there will be forces at work which have the whole solar system for their field of operation, particularly during November — perhaps even as early as September. It may be interesting to note that in the remarkably significant Sabian system of symbolism for each zodical degree, the 18th degree of Virgo, on which Uranus and Pluto meet this October 9th, is represented by "An ouija board," while the symbol for the 17th degree on which the two last conjunctions occur is "A volcano in eruption." Pluto was on this 17th degree from November 14th, 1964, to January 23rd, 1965; it reaches it again on September 6th, 1965, and on March 15th and June 20th, 1966. The ouija board symbol might be quite revealing, for the October 9th conjunction on the 18th degree of Virgo could open the door to a new approach to psychology and para-psychology which might revolutionize further our realization of the nature of mind. Such a revolution seems relatively imminent, though most official institutions of learning will probably oppose it. When one has to deal with such deep-seated and progressive transformations as the one through which we are living it is well-nigh impossible to pin-point the area in which individuals, or even each of the twelve zodiacal types of personalities, will be particularly affected. It is evident nevertheless that people in whose birth-charts mutable signs (Gemini, Virgo, Sagittarius and Pisces), are predominant — because of being tenanted by several planets, or found at the angles of the chart — can be expected to feel particularly strongly the impact of the present planetary configurations. But what is important to consider in this situation is not merely the zodiacal sign of the natal Sun, basic as this may be. What very often will matter most is whether or not a group of planets in the chart is being transited by Uranus and Pluto, or by Saturn and Jupiter, and which houses of the natal chart will be affected. The influence is certainly not to be thought of as always being negative, even if in a sense it can be considered disruptive. It is ever more or less transforming, unless the person's character and life are too unresponsive, dull or crystallized to be moved out of deep ruts of conformity to some newly established pattern, whether social-traditional or egocentric, For instance President Johnson's chart has been deeply affected by the astrological transits, as he has Sun, Mars, Moon and Mercury located in the first house between Virgo 2° and Virgo 11°. The Uranus transit has been affecting him for a long time and it was conjunct his Sun-Mars conjunction, especially from September-October 1962 to June-July 1963. Mars activated the Virgo situation in June 1963, and also when he was elected President in November 1964. Mars was stationary, very close to his Moon-Mercury conjunction, as he took definitely martial steps in the Viet Nam situation and the effect may be said to have lasted until the Santo Domingo crisis. To what extent the events before and after Johnson became President of the United States transformed his character we cannot readily say; but they certainly disrupted many aspects of his life and transformed his public status. His strong natal T-cross in cardinal signs, in which Saturn (retrograde in Aries) squares an opposition of Neptune and Venus to a fifth house Uranus will ever tend to bring him to situations in which action of vast scope is required. When Jupiter crosses his natal Pluto, August and December 1965 and April 1966, more or less in square to Saturn in his eighth house, he might find himself involved in an expansionistic move which could backfire. This example should show how complex the present astrological situation can be in its repercussion upon a person's life. Vice-President Hubert H. Humphrey is less closely affected, but his natal square of Mars at Pisces 25°18' to a rising Pluto at Gemini 26°52' no doubt also will respond to the Jupiter-Saturn square of these years 1965-1966. Dean Rusk's retrograde Jupiter at Virgo 12' has been and is still involved in the Virgo-Pisces configuration, and his Sagittarian Mars is also drawn into it. Charles de Gaulle finds himself in an equally compromising situation with five planets in mutable signs, and especially with Saturn at Virgo 16 °04' already transited by Pluto and (this September), by Uranus. His mind and ego have been seized by the ancestral concept of monarchial government. If this concept is really obsolete in France's destiny, Uranus may destroy him who incarnates it. Harold Wilson, the English Prime Minister is also affected; his 10th house Sun at Pisces 20°33' squared by his 12th house Moon in Gemini will be under heavy pressure from the opposition next March. This could mean dismissal from office or illness, or at best still heavier burdens to carry because of conditions affecting England (Uranus and Pluto in his 4th house). In Russia Leonid Brezhnev is under fire, through a T-cross in which Saturn at Pisces 10°15' squares Venus and Mercury in Sagittarius and Moon-Pluto in Gemini. Alexi Kosygin, the Soviet Premier, has the Sun at Pisces 13° squaring Pluto in Gemini and Uranus at the end of Sagittarius. Dictator Francisco Franco of Spain is, as I write this, under very serious aspects in mutable signs and his days appear limited. But obviously in a world situation such as ours is today men in politically prominent positions most logically should be affected in terms of their natal charts. The expectable results of such a relationship between natal charts and the present planetary set-up do not depend only on the Uranus-Pluto conjunction, but on the way the entire chart of an individual person is structured insofar as planets and angles in mutable signs are concerned. Less than 2000 years ago John the Baptist sounded forth the call to Metanoia, which though officially translated as repentance means a total change of mind. Today the whole sky proclaims this message.